GIR, Gujarat -- The number of Asiatic lions in Gir sanctuary and its surrounding areas has gone up to 523, an increase of 27 percent since 2010, according to the latest census report. "The census of lions has revealed that their figure has gone up from 411 to 523 this year," Gujarat Chief Minister Anandiben Patel said at a press conference here. The 2010 census had revealed the figure of Asiatic lions to be 411, she said, adding that their population has increased by 27 percent. As per this year's census, there are 109 male lions, 201 female lions and 213 sub-adults as well as cubs. In the 2010 census, the figure of male lions stood at 97, female lions were 162 and cubs were 152. Notably, the habitat area for lions has increased to 22,000 square kilometres, which has almost doubled in five years, Gir Sanctuary Superintendent Sandeep Kumar said. As per the census, 268 lions were sighted in Junagadh, 44 lions were counted in the Gir-Somnath district, 174 lions were sighted in Amreli, and 37 lions were found in Bhavnagar. "Conservation of lions is a glorious success story. More than 2 lakh lions were found in Africa, whose population has now decreased to less than 30,000. 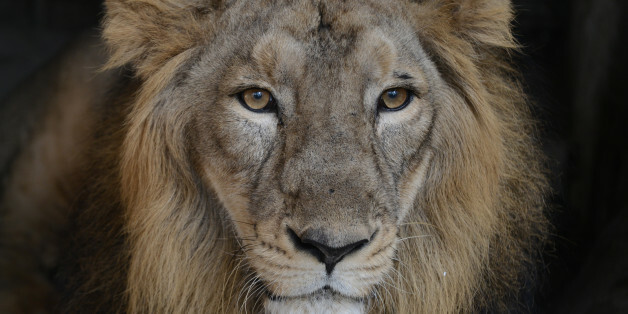 However, in Gir, the number of lions has shown an increase after every census," Kumar said. The latest census exercise was carried out between May 1 and May 5. "During this census, a method of direct sighting or direct contact was used to count lions. The earlier system of indirect evidence like pugmarks was not used this time," Kumar said. ""A Global Positioning System was used in the lion census." As per the direct contact method, after a lion was spotted, it was photographed. Instead of merely noting its location, it was tagged using the geo-reference system, the forest official said. "Generally, lions live in groups called prides. The area of a pride is also specified. So there is little possibility of duplication while counting. We also differentiated them on the basis of marks on their faces and the tuft of their tails," he said. The census was conducted by 2,500 people including 600 units of enumerators, wildlife experts, government officials, trackers and non-governmental organisations, according to the Gujarat government. Asiatic lions, which were once found in Syria, Iran, the sub-continent and in Central Asia, are an endangered species. Now, they now found only in the Gir sanctuary and its surrounding areas. The first lion census was carried out in 1936 by the erstwhile princely state of Junagadh when the lion population was around 287. During the 1975 census, which was the first conducted by the Gujarat government, their number stood at 177. The 1990 census counted 234 lions and in 2001 their number increased to 327, Kumar said.